Part of an aviation instructor’s job is helping students acquire knowledge. In this context, knowledge refers to information that humans are consciously aware of and can articulate. For example, knowledge of the fuel capacity of a particular aircraft, understanding how an internal combustion engine works, and the ability to determine the weight and balance of an aircraft are examples of knowledge. 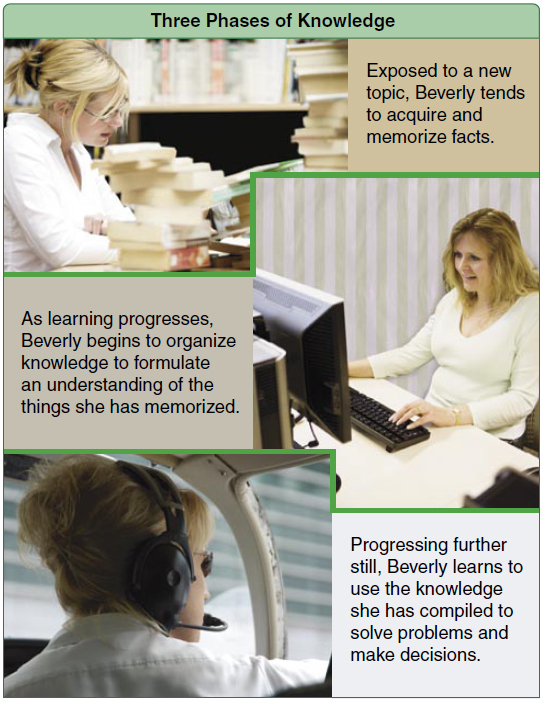 Figure 2-6 shows the three phases of knowledge, a progression of how students acquire knowledge. Some practical considerations about learning new knowledge and instructor actions that help students acquire knowledge are summarized. Figure 2-6. A student acquires knowledge through memorization, understanding, and application. A student’s first attempt to acquire knowledge about a new topic amounts to memorizing facts about steps in a procedure. For example, when Beverly is learning to use an altimeter, she may have memorized that the knob on the instrument is used to dial the current barometric pressure and that this number must be obtained from the recorded broadcast and set prior to flight. Memorizing facts and steps has an advantage: it allows students to get started quickly. For example, as soon as Beverly memorizes the purpose of the knob on the altimeter and the procedure for obtaining the current barometric pressure, she is able to properly configure the instrument for flight. The limitations of memorization become apparent when a student is asked to solve a problem or provide an explanation of something that is not covered by the newly acquired knowledge. For example, when asked whether she would rather have the altimeter mistakenly set too high or too low when flying in mountainous terrain, Beverly may not have an answer. A more experienced pilot can answer the altimeter question because she or he understands the ramifications of the question. Understanding, or the ability to notice similarities and make associations between the facts and procedural steps learned, is an important next stage in the knowledge acquisition process. At this stage, the learner begins to organize knowledge in useful ways and a collection of memorized facts gives way to understanding. Understanding develops when students begin to organize known facts and steps into coherent groups that come together to form an understanding of how a thing or a process works. For example, after learning to adjust the mixture control in cruise flight, Beverly learns that combustion requires a certain mixture of fuel and air, and that air becomes less dense as altitude increases. Combining these two ideas, she now understands the purpose of the mixture control is to keep these two quantities in balance as the aircraft changes altitude. “Mental model” or self-explanation is often used to refer to an organized collection of ideas that forms a learner’s understanding of a thing or process. The learner is no longer limited to answering questions that match the memorized facts. For example, armed with the understanding of the mixture control, Beverly may now be able to produce answers to more challenging questions, such as what would happen if the mixture were set too rich or too lean. Learners who understand a process have an easier time mastering variations of the processes, such as unfamiliar aircraft, new avionics systems, and unfamiliar airport procedures. Understanding shared between people allows them to communicate more efficiently. For example, an experienced pilot might mention to an experienced mechanic that a magneto ran a bit rough during an engine run-up. This brief communication triggers access to a wealth of knowledge in the mind of the mechanic who instantly knows what must be done. Learners who understand the purpose behind procedure steps are better able to remember the procedure steps later, or reconstruct them when they are forgotten. Concept learning is based on the assumption that humans tend to group objects, events, ideas, people, etc., that share one or more major attributes that set them apart. It also involves discrimination between types of things or ideas inside or outside of a concept set. By grouping information into concepts, humans reduce the complexities of life and create manageable categories. Although many theories about concept learning exist, categorization has always been a central aspect. Concept learning enhances student understanding when students formulate generalized concepts from particular facts or steps. Generalized concepts are more powerful than facts because instead of literally describing one thing, they describe many things at once. For example, a new flight student who sees several examples of weight-shift control (WSC) aircraft may formulate a category for WSC aircraft based on the wing, which is large and fabric covered. The power of the category becomes obvious when the student sees a sport plane. Because of the similar wing, he or she immediately categorizes it as an ultra light and ascribes many of the properties of ultra light aircraft to the sport plane. In this way, the student has used a generalized concept to begin understanding something new. Most learners exhibit a natural tendency to categorize and become adept at recognizing members of most any category they create. If something is encountered that does not fit into a category, these learners formulate a new category or revise the definitions of existing categories. In the above example, the student eventually must revise the category of ultra light to light-sport aircraft which encompasses both types of aircraft. Therefore, an important part of the learning process is continual revision of the categories used when learners encounter new things or exceptions to things previously catalogued. Another type of generalization is a schema (the cognitive framework that helps people organize and interpret information). Schemas can be revised by any new information and are useful because they allow people to take shortcuts in interpreting a vast amount of information. Humans form schemas when they notice reoccurring patterns in things frequently observed or done. Schemas help learners interpret things they observe by priming them to expect certain elements that match the schema. For example, schemas demonstrate why an experienced pilot is able to listen to and read back a lengthy departure clearance issued by air traffic control (ATC). Beginning flight students often remember the controller’s use of the words “the” and “and” and fail to note more important words that describe assigned altitudes or radio frequencies. The experienced pilot is successful because he or she possesses a schema for this type of event and knows in advance that the clearance contains five key pieces of information. While listening to the clearance, the pilot anticipates and is primed to capture those five things. Similarly, students create schemas for preflight inspection procedures and procedures required to operate advanced flight deck systems such as autopilots or multifunction displays. As with categories, humans continuously learn new schemas and revise old ones to accommodate new things as they continue to learn. While schemas help humans deal with information, they can also make it difficult to retain new information that does not conform to established schemas.